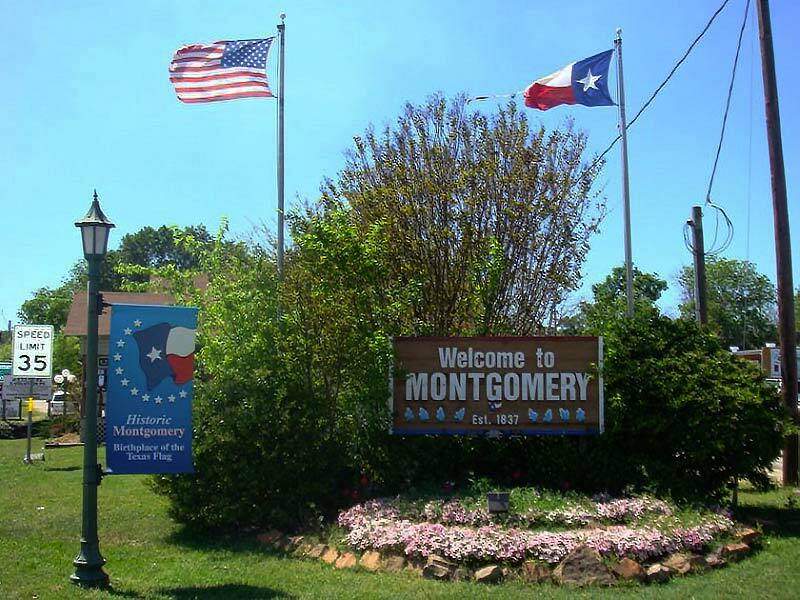 Situated on a 200-acre tract of land, Montgomery is one of the oldest towns in Texas. Montgomery was founded by W. W. Shepperd on land which was formerly part of the John Corner league. W.W. Shepperd founded Montgomery in 1837, and he and his partner gave the town its name. Montgomery is part of Montgomery County and was the first county seat in the county after it was created. From the most recent census, the total population of Montgomery is about 700. Montgomery was first a trading post in 1827 before it was chartered in 1837. The origin of the name of this town is traced to several of its early dwellers. Some evidence indicates that the name “Montgomery” was taken from the surname of early dwellers who include Andrew Montgomery and Owen and Margaret Montgomery Shannon. Other evidence indicates the name of the town was from that of Lemuel P. Montgomery, an army major who served alongside Sam Houston, the president of Texas republic when Montgomery was created. According to this evidence promoted by Carrol Cagle and Kameron Searle, the founders of Montgomery town capitalized on the connection of Sam Houston to Lemuel P. Montgomery, who he died during war to get the approval of the Montgomery name for both the county and the town. Located close to the southwest corner of Sam Houston National Forest, Montgomery was nicknamed the birthplace of the lone star flag because of the claims of Edmund B. Stewart that his father, Charles B. Stewart, one of the early Montgomery settlers designed the lone star flag. Although the only proof of this claim is a letter draft and a supposed original design of the flag, the claim still earned Montgomery the “birthplace of the lone star flag” tag. Montgomery holds a lot of attractions for visitors, from museums to water parks. Visitors also get to explore well-preserved history in sites in Montgomery. Residents of Montgomery get to enjoy the serene countryside lifestyle. The best moving services for moving your goods and delicate properties within Montgomery and from Montgomery to other neighboring areas is assured with M&M Moving Company. We are fully licensed and equipped to provide the best moving services within Montgomery, TX. The protection and proper movement of your goods and properties are our major concerns, and we provide the best quality of services. We are unarguably the best moving company within Montgomery, and we tailor all our services towards your ultimate satisfaction. We understand that it takes a great deal of trust to commit your goods and properties to us. That is why we aim to earn your trust even more with every single transaction with us. Even your most delicate items are safe with us. All members of our team are fully committed to giving you the best quality of service, and we are always ready to help you move your goods and properties. In addition to routine training, all our staff are licensed and well experienced. We have also worked on a range of requests for over 30 years, and we are confident of delivering the best services.